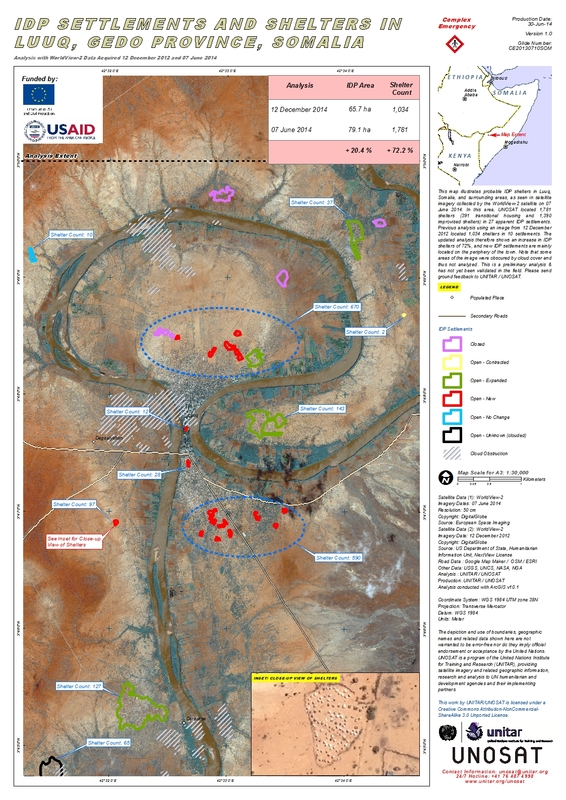 This map illustrates probable IDP shelters in Luuq, Somalia, and surrounding areas, as seen in satellite imagery collected by the WorldView-2 satellite on 07 June 2014. In this area, UNOSAT located 1,781 shelters (391 transitional housing and 1,390 improvised shelters) in 27 apparent IDP settlements. Previous analysis using an image from 12 December 2012 located 1,034 shelters in 10 settlements. The updated analysis therefore shows an increase in IDP shelters of 72%, and new IDP settlements are mainly located on the periphery of the town. Note that some areas of the image were obscured by cloud cover and thus not analyzed. This is a preliminary analysis & has not yet been validated in the field. Please send ground feedback to UNITAR / UNOSAT.